As night falls sooner, kids don't want to come inside and end the fun. The games in the backyard can continue a little longer with the help of Super Glow Bracelets. Super Glow Bracelets are fun glow in the dark accessories that kids (and adults) can enjoy. With 100 bracelets in a single packet, everyone can create oodles of fun activities that shine through the darkness of night. The Super Glow brand of glow bracelets can glow between 8 to 10 hours. After this amount of time, the brightness begins to fade, but some light may still be visible for many more hours. More importantly, these bracelets won't start glowing till the user activates them. Even if you don't use all 100 bracelets upon opening the container, do not worry. The bracelets have a 2 year shelf life if left unactivated. 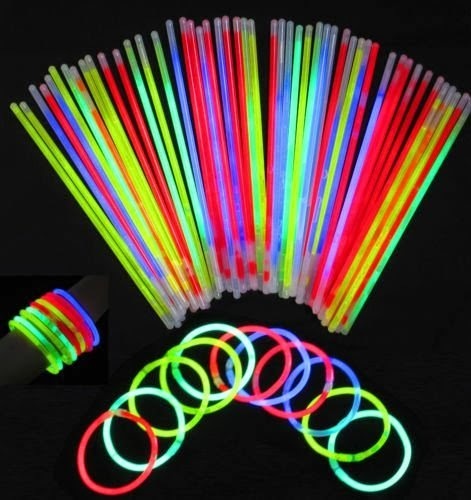 While many kids enjoy using glow bracelets for outdoor concerts, fireworks or even scavenger hunts, the glow bracelets can have other fun uses as well. We have used some bracelets as path lights to hidden treasures or markings for ghosts in the graveyard. The kids can hide a trinket or clue in a tree, under a deck or nestled between the fence post. The goal is to uncover all the treasures before time is up. The kids have fun running around yard, but the darkness isn't overwhelming due to the glow sticks. Our family keeps a container of the Super Glow bracelets in the house all year long. With the extended shelf life, we do not have to worry about the bracelets working. Plus, when buying in a larger quantity, the price is beneficial. Super Glow brand bracelets are available on Amazon.com. A 100 bracelet container retails for under $10.